I am so lucky! I have the greatest friends! They send me pictures from their vacations! 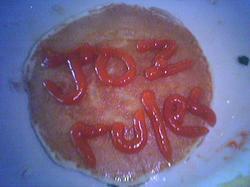 It's a pancakey (albeit ketchupy) "Joz Rules", directly from Eggs 'n Things in Waikiki from stkyrice and aiyahh (where they've been marathoning & vacationing all week). I will send you a post card while I am in Vegas in the next couple of days. Ketchup is only for french fries and bad meat loaf. Hi from Apple Store @ Ala Moana, Honolulu! Suffice it to say that the pancake was already cold, and there was no way in hell we were going to eat the thing. Besides, there were other options available to us to write both of these things, more tasty combinations like pancake syrups. However, the syrups were a bit too thin. The guava syrup would've been cool (but pink), and the coconut syrup would've been WAY too suggestive but tasty. Ah yes, I am one of those locals that thinks it's cold at night in Hawaii. It is strange but it really does feel colder at 65 at night than it did in the 50s in New York City around Thanksgiving. Can't explain it. It's always nice to know you have friends who think about you, isn't it? 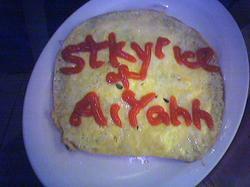 Pancakes with ketchup is bad, but with eggs would taste good :D Cute pics! I haven't been to Hawaii in years, but was there once when I was very little with my parents- it's where I was naturalized as an American citizen!